When you are trying to make sales from your website with emails, you need an auto-responder mail that subscribers can't wait to open. Marketers use such automatic mails to follow-up on opt-ins from subscribers, send welcome mails to new subscribers, or share a series of information emails. Auto-responder campaigns are absolutely essential for any email marketing strategies today. They keep you at the top of the subscribers' minds. They help you convert leads to customers more effectively than any telemarketing can do. To run an effective auto-responder campaign, you also need a low cost email marketing system. Maybe you are already using a traditional auto-responder like Aweber. If you are, you are probably paying a monthly subscription. If you are using SMTP pay-as-you-go services instead, you're still very likely paying around $200 a year. IMSC Rapid Mailer tries to be a cost-effective alternative to these auto-responders for all your email marketing campaigns. What does Rapid Mailer give you? 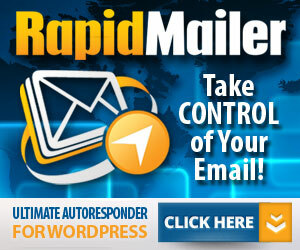 Rapid Mailer is a Wordpress plug-in. If you have used Wordpress, you will know that Wordpress plug-ins are very easy to install, and this is no exception. You can install Rapid Mailer and set it up within minutes and get your first list started immediately. You can then manage your auto-responder list yourself without a hassle. Rapid Mailer lets you set up multiple campaigns. It lets you change your campaign quickly and easily, giving you complete control over your campaign. Here is a scenario in which this feature comes in useful. If you have a series of emails ready for leads, and one particular lead buys a product only after one email, you can quickly switch off the follow up emails. You don't need another opt-in from that customer, in order to begin sending them another set of emails about a related product. You can also import lists into Rapid Mailer without asking your customers to opt-in again. There are some other great features that Rapid Mailer offers users. You can use these features to save time and make the most of the time that you do spend on creating each email. For instance, you don't need to use any external editor for writing your emails. You can use the Simple Wordpress email editor to create and edit your auto-responder mails. If you have great content that your subscribers have enjoyed, you can use Rapid Mailer to publish the email as a blog post. Want to make some money by setting up a subscription service to manage other people's lists? Rapid Mailer lets you do that too. Overall, IMSC Rapid Mailer is designed to take quite a lot of headache out of email marketing. Let us look at the pros and cons objectively. There are several reasons why Rapid Mailer is a great auto-responder, when you compare it with other traditional and standard SMTP services. Let's take a look at these reasons. #1 Firstly, Wordpress users are at an advantage here. If you have a Wordpress blog or website, you're good to go. Rapid Mailer can easily install into your site and prepare your list for mailing without a hassle. In fact, Rapid Mailer can get you a list right from Day One by grabbing the email addresses of your LinkedIn and Facebook connections. #2 The second attraction of Rapid Mailer is the price. Unlike other auto-respoders like Aweber, you don't need to pay monthly subscription fees. All that you have to pay is a one-time price to download the plug-in. After that, no matter how long your list grows, Rapid Mailer is completely free! In terms of pricing, the plug-in is a hands-down winner over Aweber, where the costs skyrocket if your list grows longer than the default limit of 500. To download the plug-in, you currently have to pay a very affordable special price of $67. This lets you install the plug-in and use it on three personal sites. But what if you don't have three sites? If you only have one website to manage, why pay for a multi-site plug-in? The single-site version of IMSC Rapid Mailer is available for only $27. You will be presented with this option when you exit from the payment page. There are other features that you can pay additional (one-time) costs for, such as an advanced list-building training (for $97) and a Pro Version upgrade ($47) for four other lead building plug-ins etc. These are bonuses that you may not need. But if you do, the costs are affordable. #3 If after using Rapid Mailer you decide that it is not working for you, you can get your money back. There is a 30-day money back guarantee for customers who are not satisfied. And unlike many other money back guarantees, you are actually likely to get your cash back. No one to my knowledge has asked for their money back after having used Rapid Mailer, but if we go by the company's customer service, we can only expect great response in such cases. #4 You get training on how to use Rapid Mailer with a user guide. You will even find a video series for a quicker understanding of how to set up and use the plug-in in minutes. #5 You can use your own website host's mailing system with Rapid Mailer, if you don't want to use third party mailing systems. The Rapid Mailer team does recommend using third party mailers for the best results. This doesn't mean they don't offer support if you use your host's internal mailer. You still receive training on how to set up Rapid Mailer on your website and get the best results. In order to avoid disappointments with IMSC Rapid Mailer, it is best to know exactly who will benefit from it, and who will not. That brings us to the (very few) cons. #1 Rapid Mailer is designed for use with Wordpress, so you need to have a Wordpress website or blog. But since Wordpress is one of the most popular CMS systems, it is not surprising why the plug-in was designed for use it Wordpress. #2 Another pain point for users may be the multiple numbers of configuration options. Setting up all the various options perfectly for your site can get confusing and time-consuming. But overall, with a little patience and some help from IMSC Rapid Mailer support, you should be on your path to maximizing your mailing lists. I am very satisfied with the simplicity and effectiveness of this plug-in. It is a nifty little tool to add to your online marketing toolbox. Rapid Mailer is for those who want greater flexibility over their website and great control over their email marketing expenses. It is easy to install, relatively easy to use and gives you plenty of little conveniences in managing your auto-responder campaigns. Add to this is the absence of monthly fees and you have an attractive low-cost plug-in there is no reason to ignore. Ultimate eBook Creator Review: Does It Worth It?